Representing over 100 years of experience, RC Heating & Cooling are your HVAC experts in McPherson, Kansas. RC Heating & Cooling provides services for heating, air-conditioning, electrical and refrigeration. 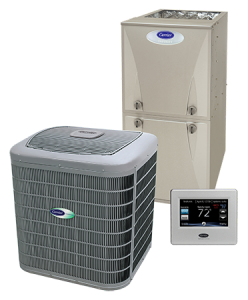 Our expertise extends beyond a basic residential HVAC system — we sell and service heat pumps, ground source systems, boilers, chillers, and coolers to name a few. Just like it says on the vans, here at RC, our purpose is to keep you comfortable no matter if it’s in the heat of summer, or the frigid air of winter. With the present technology available, there’s no reason for you not to be comfortable indoors. Carrier creates their designs with the environment in mind and sets environmental performance targets for their products. In nearly every category, Carrier offers industry-leading, energy-efficient options for their customers. They continue to invest in research and development, applying the newest technological innovations to create ever more sustainable solutions. Carrier and RC Heating & Cooling – Where Quality Matters!!! RC Heating and Cooling is a locally owned heating and cooling company founded in 2002. We strive to bring quality and comfort along with innovative equipment to our customers. Creating the kind of indoor air quality our customer’s desire. We provide quality service, energy saving equipment and a healthy, Comfortable home, with Carrier’s innovative equipment. Our trained technicians are here to help you with your heating & cooling needs and repairs of all brands. In addition to repairs we also replace, upgrade, and change out systems, where we constantly build upon our history of proven innovation with new products and services that improve your comfort and efficiency. RC Heating & Cooling strives to better the comfort levels of its customers. It will work on maintaining loyal employees. It will strive to perform quality work in a reasonable time. RC Plans to deliver the job as promised while pushing for constant improvement.